A chin augmentation helps to refine the jawline and add balance to facial features. Using a custom-fit, biocompatible chin implant, Dr. Parker can help you add definition to a weak or receding chin. A “weak chin” can make an appropriately sized nose and other facial features stand out. It can also cause men to be very dissatisfied with their profile. The surgical insertion of a chin implant, called “chin augmentation,” can improve your profile by creating better facial balance. There are many different sizes and shapes for the chin implant, so you can achieve the specific look you desire. Computer imaging can be used to assist you in making this important decision. The silicone material of the implant also looks and feels very similar to bone, so the result is a very natural looking, natural feeling and defined chin. When performed by an experienced board certified plastic surgeon, chin augmentation can be one of the most rewarding plastic surgery procedures for men. Men often report a significant increase in their self-confidence, and enjoy looking more masculine. Chin augmentation can be done by itself to build out a weak chin, or in conjunction with other procedures to balance the face. 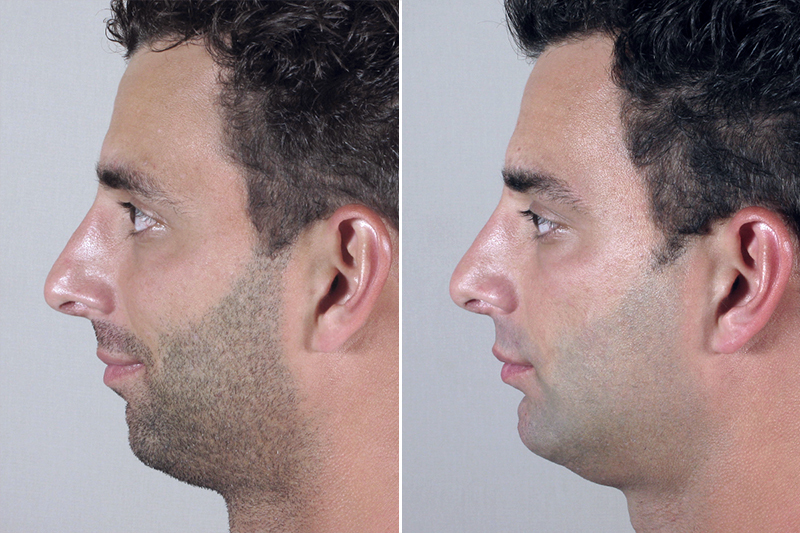 Rhinoplasty to improve the shape of the nose is one of the most popular procedures for men. Surgical procedures to improve the jaw and neckline, such as liposuction of the neck, face lift, or neck lift can further enhance the results of chin implant surgery for men. The following photos demonstrate how these procedures complement the results of chin augmentation. For this 42 year old patient, Dr. Parker performed an open rhinoplasty to narrow the nose along with a chin implant to build out the chin. This patient chose to have chin augmentation in tandem with neck liposuction to create a stronger jawline. Chin implant surgery takes about 20 minutes, and can be done under local anesthesia with sedation. Dr. Parker makes a ¾ inch incision, hidden just beneath the chin. The tissue is gently stretched until enough room is created for the implant, which will lie directly on the bone. Dr. Parker inserts a custom-selected silicone chin implant into the newly created space, directly on the jawbone. Finally, small sutures are used to close the incision. Sutures are removed within 5 days. For approximately 6 weeks, it is important to avoid activity that could jar or bump your chin. The scar tissue that forms around your implant is crucial to keeping it in place. It must remain undisturbed until you are fully healed.